Still, no matter how careful you are when cooking, your oven is bound to get oils and grease over time. The good news is that there are many oven cleaning products that will make your life easier. Below are the best oven cleaning products for baked on grease. If you are a looking for a good cleaning product that is a compromise between chemical and organic ingredients, the Carbona Biodegradable Cleaner is your best option. Baking soda is the main ingredient of the cleaner and, hence, is safe to use around your home. The oven cleaner comes in a spraying bottle. Carbona Biodegradable has no harsh smells or toxic fumes. Using the cleaner is easy; simply spray the stain, wait a few minutes, and then wipe the oven clean. Natural Organics is an organic product that does not have any chemicals. This organic oven cleaner is made from 100% plant-based ingredients. Therefore, you can be sure that by using it, it won’t leave any toxic chemicals in your kitchen. The organic cleaner is as strong and chemical oven cleaners, making it easy for you to remove even the toughest stains with very little work. The product comes with 100% money back guarantee. The Mr. Muscle Oven Cleaner is an aerosol cleaner that only requires you to spray it on the stain, leave for a couple of minutes, and then wipe down. This product is easy to use and will make it easy to clean the grease from your oven. Mr. Muscle is not as famous as the other oven cleaning brands on our list. However, it is an excellent option for cleaning not only ovens but also barbecue grills. The Easy Off is one of the best oven cleaning products in the United States. The cleaner is affordable and does not produce toxic fumes that can affect your kitchen or cooking. The aerosol cleaner is also easy to use; simply spray it on the stain and leave for 30 seconds (when spot cleaning) or 40 minutes (when deep cleaning) before wiping clean. If you are planning to do a more intense cleaning, there is a stronger version of the Easy Off Professional cleaner that you can buy. However, the standard version works just fine for most cleanings. Baking soda, also known as bicarbonate soda, is a natural cleaning agent that can remove grease stains on ovens. This natural product is not made with any chemicals and will last for years if stored properly. 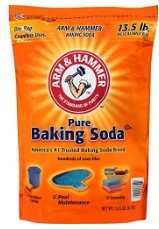 There are different baking soda brands on the market, with the most famous one being ARM & HAMMER. However, the brand name is not really important as the ingredient is usually the same. To use baking soda to clean baked on grease on an oven, mix the ingredient with lemon juice, water, or vinegar to create a paste. After creating the paste, apply a small amount on the area with the grease stains and leave to soak for 30 to 60 minutes, depending on how bad the stain is. After soaking, the baking soda will soften the stain, which you can then easily wipe clean. Using the above oven cleaning products will get your oven clean in no time. The best oven cleaner to buy would depend on what you are looking for. If you prefer using natural products, the Carbon Biodegradable Oven Cleaner is the best option. This cleaner has all the features of using baking soda but without the fuss. Overall, the Mr. Muscle Oven & Grill Cleaner is our top recommendation. This oven cleaner is affordable and clearly works, as can be seen from reviews left by customers on Amazon. This product is versatile as it can be used for cleaning not only ovens but also other appliances such as barbecue grills. This cleaner will easily remove even the most stubborn grease stains.